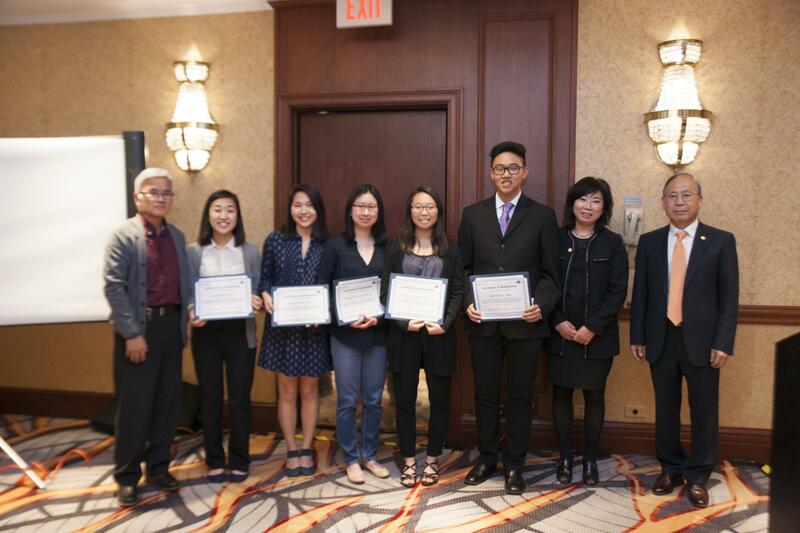 Purpose: RCCKN awards scholarships to college-bound high school seniors based on demonstrated academic, leadership, athletic, community service accomplishment. Criteria: The students eligible for assistance must be graduating high school junior and seniors during the 2018-2019 school year, who reside in Illinois and intend to continue their education at a college or university. Student should submit a scholarship application on the form provided by RCCKN website. Deadline: The application deadline is March 25th 2019. 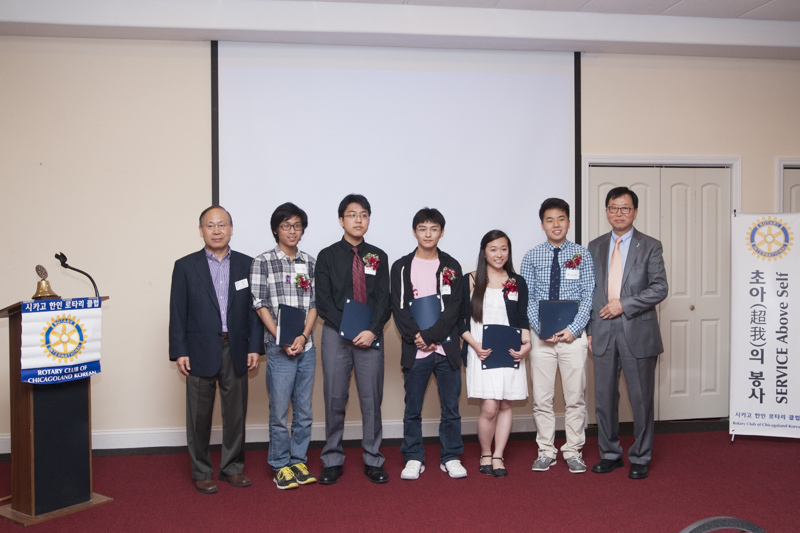 5 students will be awarded. 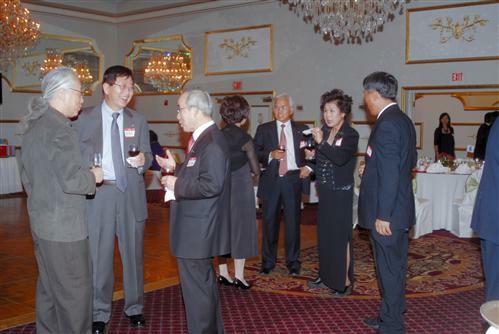 The Rotary Club of Chicagoland Korean-Northbrook 9'th Charter Night Party on Monday August 21'st 2017 at  PINSTRIPES. A benefit golf outing for RCCKN Schoarship Fund was held at Kemper Lakes Golf Club, Kildeer, IL on 9/20/16. 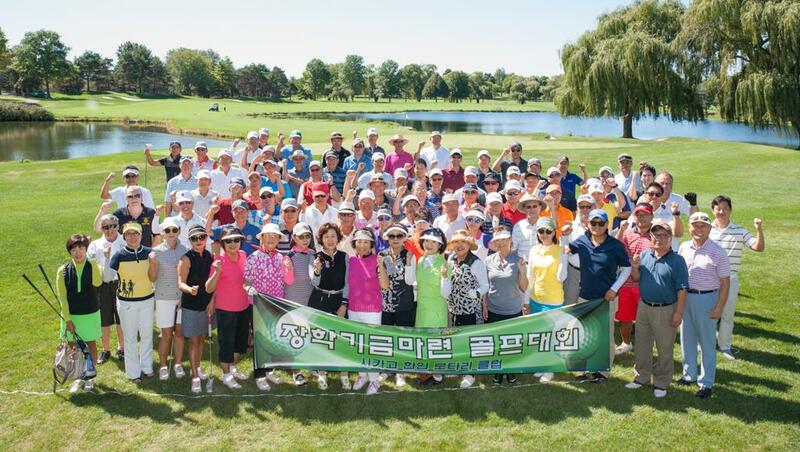 More than 120 Rotarians and guests participated for the good cause and enjoyed comradery and a day of golf. [시카고교차로] 시카고 한인 로타리클럽이 창립 9주년을 맞아 지난달 27일 오후 6시 최은주(Julie Choi) 회장 자택에서 가족같은 분위기로 차터 나잇(Charter Night)을 보냈다. 이 자리에는 약 30명의 회원이 참석했다. '차터 나잇'은 국제로타리에 가입 승인된 날을 기념하기 위한 저녁모임을 말한다. 로타리클럽 관계자는 "예년 호텔에서 가진 행사에 비해 더 화기애애한 분위기에서 늦은 시간까지 자발적으로 BBQ를 하며 편안한 자리를 함께 했다"고 전했다. 한편, 지난 2008년 시작된 시카고 한인로타리 클럽은 그동안 소아마비 퇴치와 제 3세계 어린이들을 위한 구호활동에 전념해 왔다. 아울러 7K 마라톤 행사 등 시카고 한인사회 참여 및 봉사에도 앞장서 왔다. 이달에는 골프아우팅 행사도 예정돼 있다. 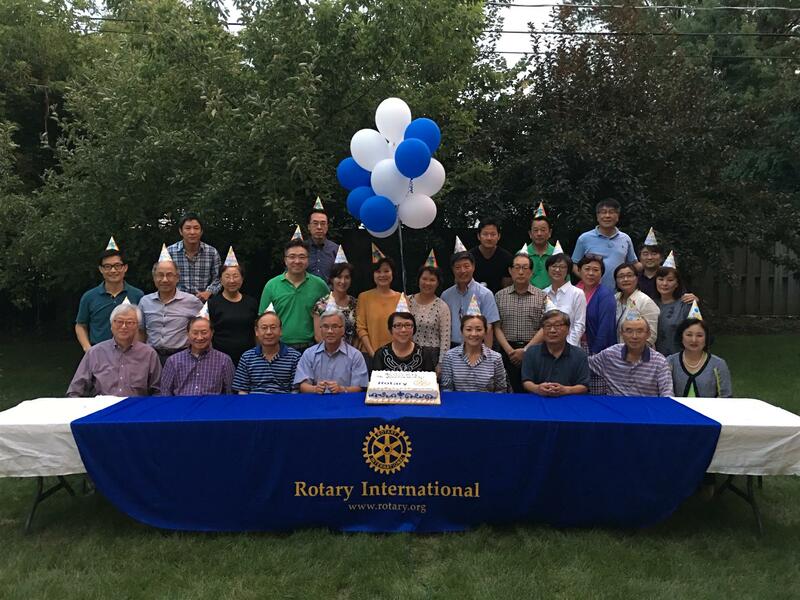 The 9th charter night of the Rotary Club of Chicagoland Korean was celebrated among the members and friends of the Club at the residence of Julie Choi, President of the Club on August 27, 2016. 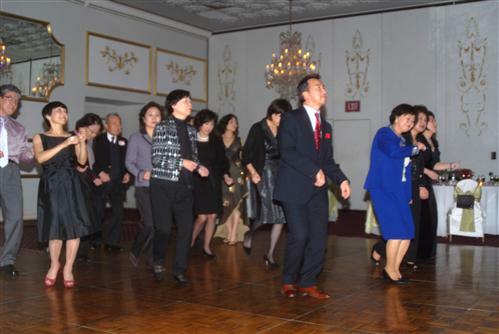 The well-attended party featured Korean BBQs and other Korean delicacy and provided ample opportunities to mingle, socialize and talk about upcoming events and activies of the Club. Long Live RCCKN! 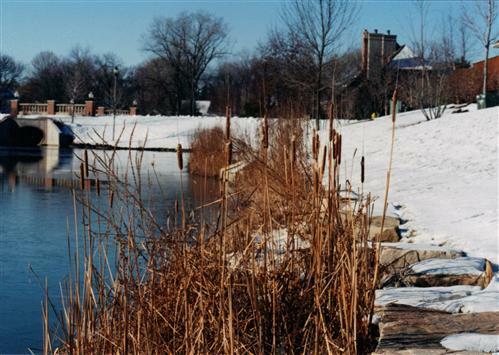 Place: Hilton Chicago/ Northbrook, Garden-Pond Rm. 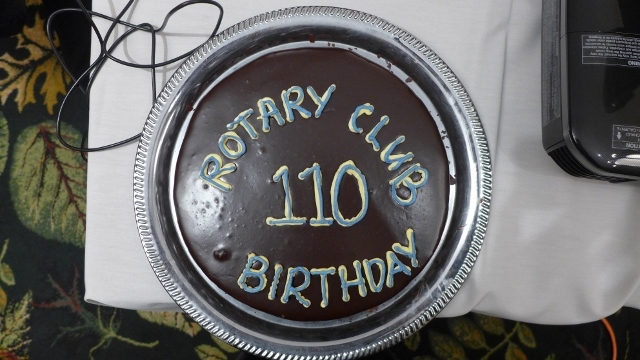 Induction Ceremony for 3 New Members at 110th Birthday of Rotary on February 23rd 2015.
for End Polio Now, and Feed Children in North Korea. 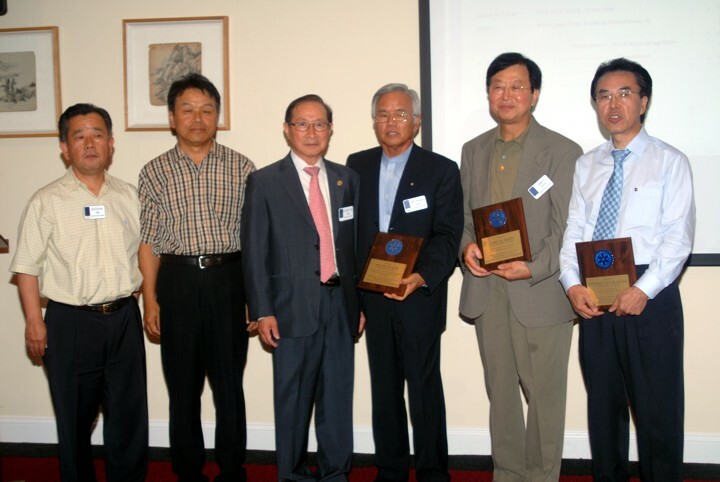 was held at Woo Lae Oak, Chicago, IL on June 23, 2014. 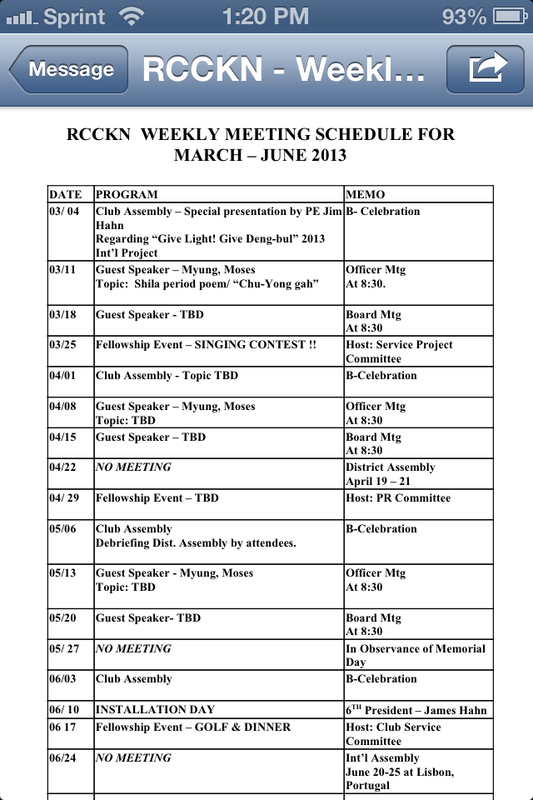 Give Lights, Give 등불 - February 2013! "Give Lights, Give 등불 - February 2013" -- 시카고 한인 로타리클럽은 국제 봉사사업의 일환으로 2월15일부터 19일까지 도미니카 공화국에 봉사단을 파견, 현지 극빈 가정 250세대에 태양열 등불을 기부하고 주민들을 찾아 성금을 전달하는등 봉사활동을 펼쳤다. 박현주 회장이 이끈 6인 봉사단은 도미니카 공화국의 수도 산토 도밍고에서 약 200마일 서쪽에 소재한 빈민타운인 라스 야야스 (Las Yayas)와 로스 토로스 (Los Toros)의 2개 초등학교를 방문해 극빈층 학생들과 그들의 가족을 대상으로 인도주의 봉사를 펼쳤다. Membership Application Form is available in the Club Document Section. For the applicaton of a new member, this form should be used. It is my honor and privilege to serve you as the Club President for RY 2011 – 12. 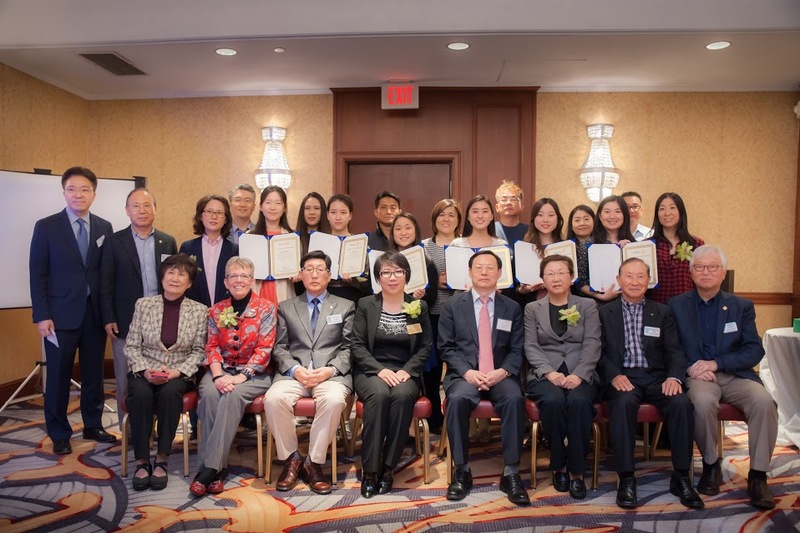 Since it was founded in 2008, the Chicagoland Korean Rotary Club has actively participated in various service projects locally and worldwide. These past achievements were made possible due to the warm heart and enthusiasm of our preceding presidents, Dr. 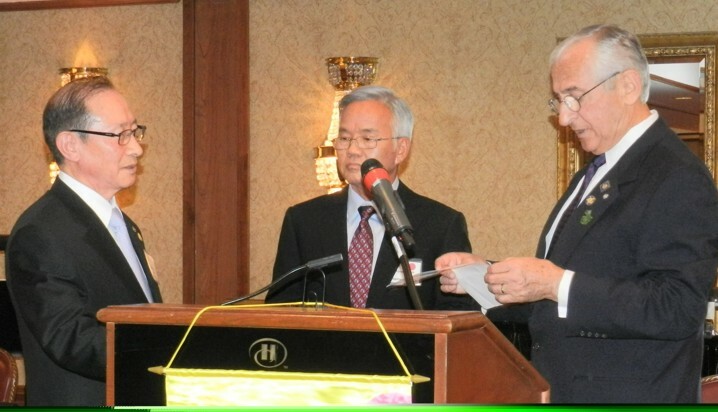 Sung Won Kim, Mr. Won Yoon, and Dr. Byoung In Suh, Ph.D. ‘Reach Within to Embrace Humanity’ is the theme of 2011 – 12 RI. Carlos Früm, the Governor of Rotary District 6440, asks us, ‘Why did you join Rotary?’ It is because we want to help others, as it is part of our humanity. ‘Service and Fellowship’ is our Club motto. We will continue to strengthen the fellowship between the club members, which is a prerequisite element for providing humanitarian service, be it within our community or global-wide. Our committees are encouraged to commit to various service projects. We will continue to strive to be true Rotarians. We will work together and dedicate ourselves to service. I wish you will enjoy your time in the club. 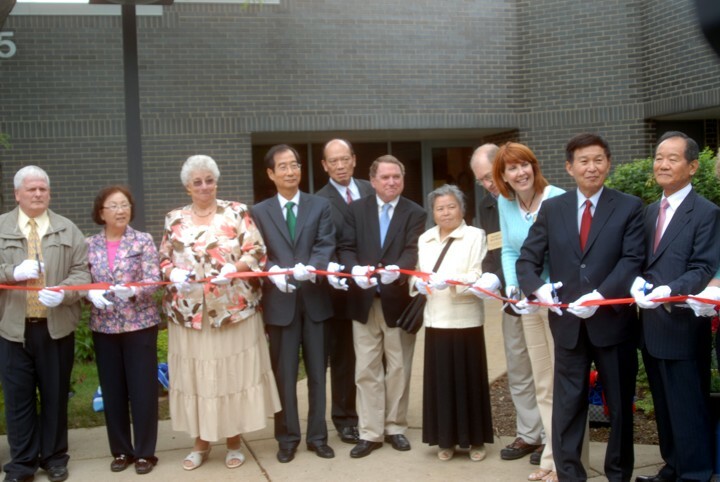 On June 24, 2011,the inauguration ceremony of new Chicagoland Korean Rotary Club took place in conjunction with the inauguration of District President. 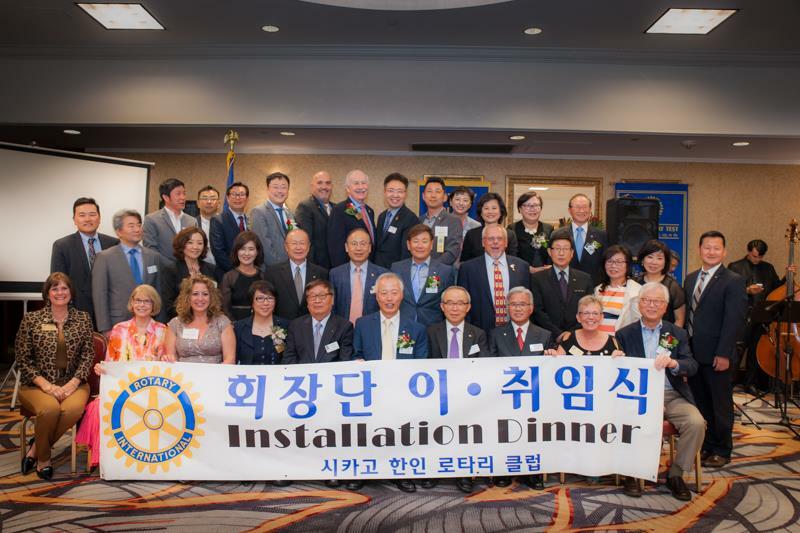 Paul Byung Tag Kim tookover the duty of presidency of Chicagoland Korean Rotary Club while Mr. Frum tookover the presidency duty of District. 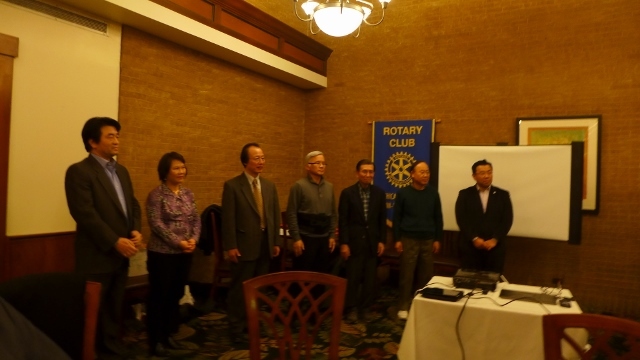 The inauguration ceremony was held in Northbrook Hilton Hotel master ceremonied by our rotarian Jane Park. After ceremony, entertainment program including Korean traditional folk dance followed. comprises three groups; Girls Choir, Boys Orchestra, Girls Folk Dance Group. part of Korean Heritage by learning Korean culture. 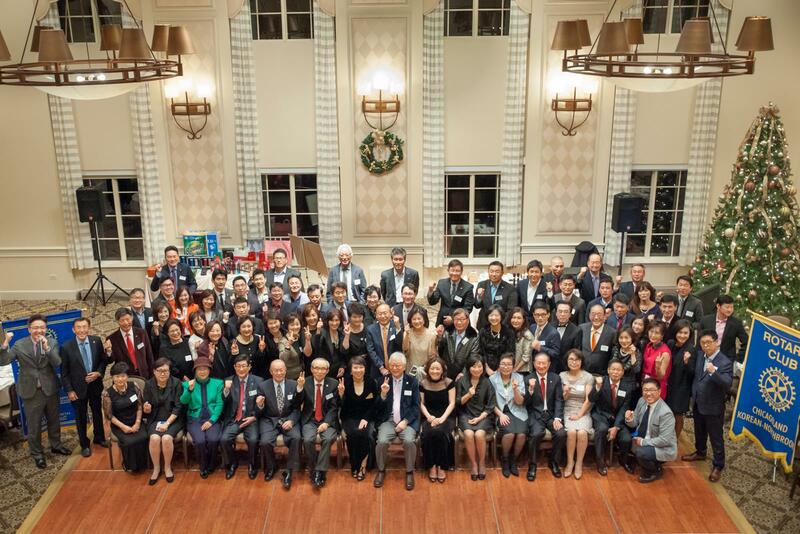 Oh, Shin Ae has served very successfully this organization as the president of Board of Directors since 2006. We wish for much success with her work and promising future project! How are you while it is tormenting cold out there? everyone doing out there while it is freezing cold? downhill skiing, etc. we may encounter wonderful nature and even have fun. rather enjoyment so that we can get by easier. 시카고지역 한인 로터리클럽에서 문화회관 구입증축을 축하해 텔레비전 한 대를 증정하기로 결정하여 11월 22일 저녁 모임에서 수표 $3,000 불을 강영희 문화회관 회장에게 증정했다. 이 텔레비전이 문화회관이 주관하는 문화활동에 큰 도움이 되기를 모든 회원이 바라는 바다. 김총무님의 클럽연말 파티 에관한 Announcemnt 입니다. 반드시 RSVP 를 해 주시고, 연락은 김경자 부총무님께서 해 주시면 참석 인원을 카운트하실 겁니다. 또 한 가지 특별히 부탁드릴 사항은 Minimum 인원이 있으니 회원님들은 가능한 부부동반해 주시고 Guest 도 대환영입니다. 그리고 회원 일인당 (부부에 하나) $30 상당의 교환용/뽑기용 선물 지참 바랍니다. RSVP 는 다음 Link 를 이용하여 주시면 대단히 감사 하겠습니다. 내 것이 누구한테 갔는지도 알 수 있어 좋을 것 같네요. Violin virtuoso and polio survivor Itzhak Perlman joins members of the Chicago Symphony Orchestra in his only Chicago performance this season for a concert benefiting Rotary's campaign to end polio worldwide. Make a note in your calendar! Seminar on "Gardening for Nature Conservation"
2013 Installation Dinner was held at Woo Lae Oak, Chicago, IL on June 24, 2013. A new club brochure has just been published. 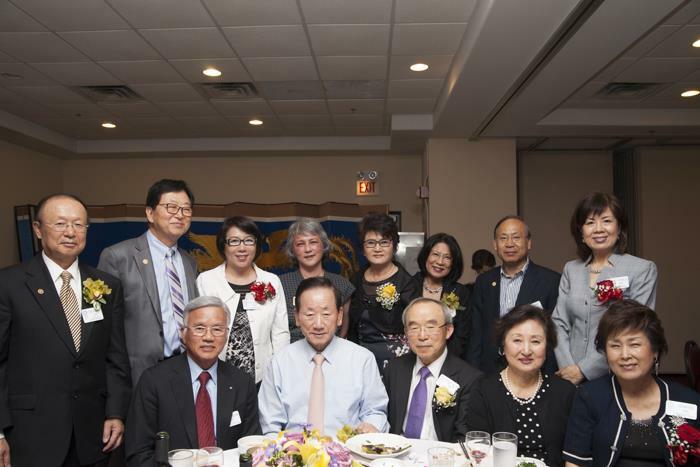 It provides a bird's eye view of Rotary Club of Chicagoland Korean-Northbrook. Please feel free to distribute it to interested parties to let them know who we are; what we do; how they can join or help us for good cause; and so on. Distribution of the brochure is easy: Just copy, paste and send the following links; Download, print and distribute; or pick up hardcopy brochures during weekly meetings for distribution. At the weekly meeting on Mar. 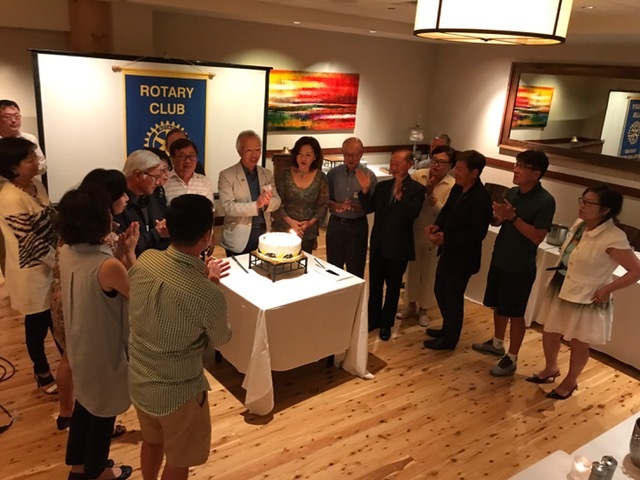 26, 2002, the talk was given about rotary club fund as to collection and usage by the honorable Walter Reed, Dist 6440 Foundation Chair. Because of illness of the webmaster, this site has been neglected. However, thanks to remarkable improvement with the treatment, I became to be active again although not in 100 percent. Many thanks to those who send to me get-well cards, e-mail, telephone calls, and visits, who supported great deal to give me so much moral support. 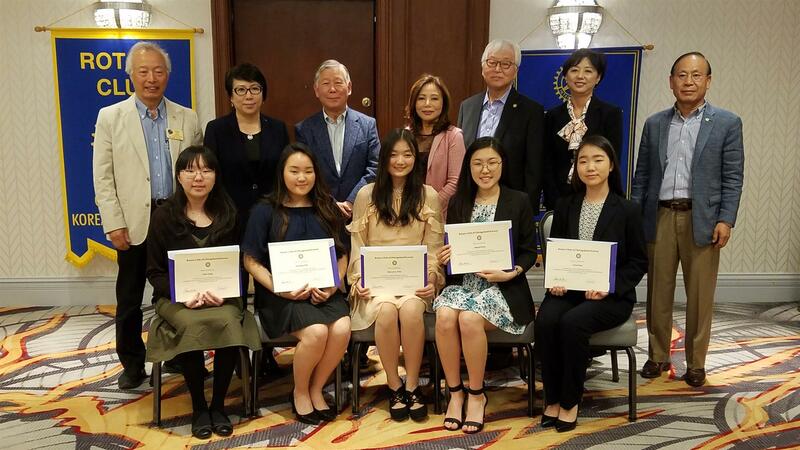 Thank you for applying for the Rotary Club Scholarship. ethical standards in all vocations, and help build goodwill and peace throughout the world. Applications must be submitted by Oct. 27, 2011. We will notify scholarship recipients by early to mid-November. Please find all necessary application forms on the following pages. 시카고 한인 로타리 클럽에서는 현재 시카고 인근에 위치한 각 고등학교에 재학중인 11학년/ 12학년 한국 학생들 중에서 아래와 같이 우수한 장학생을 모집합니다. 장학금 지원에는 다음과 같은 서류가 필요합니다.
. 사회 봉사 경력, 날짜, 단체 이름, 사회 봉사 기간. 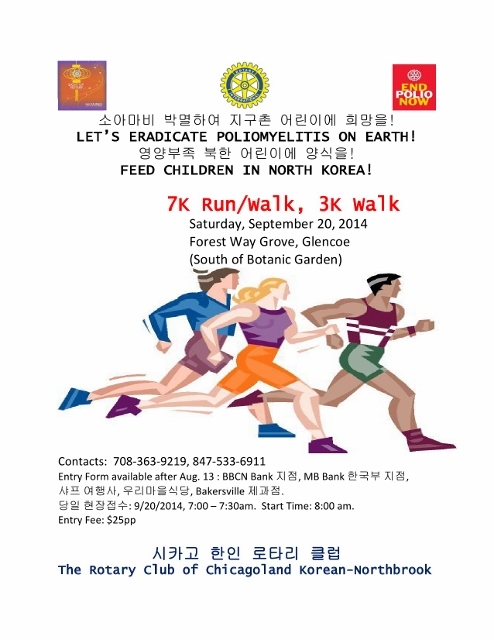 12월 Chicagoland Korean Rotary Club 연말 파티에서 거행하게 됩니다. 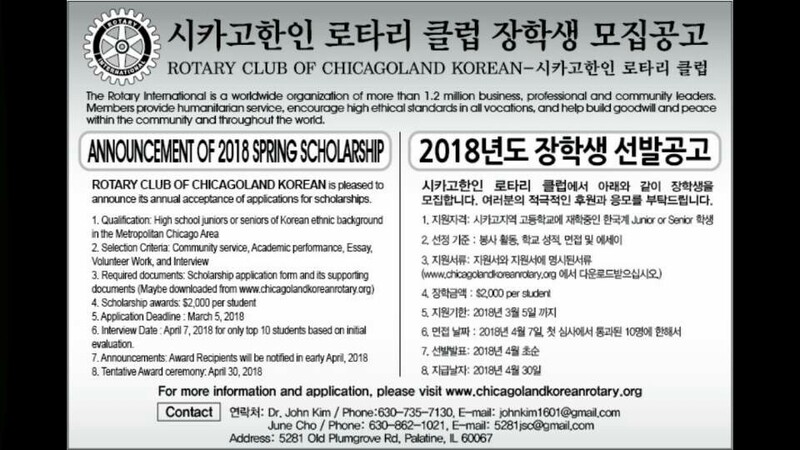 지원 서류는 www.chicagolandkoreanrotaryclub.org 에서 받을 수 있습니다. 질문이나, 그 외의 사항은 아래와 같이 연락바랍니다. 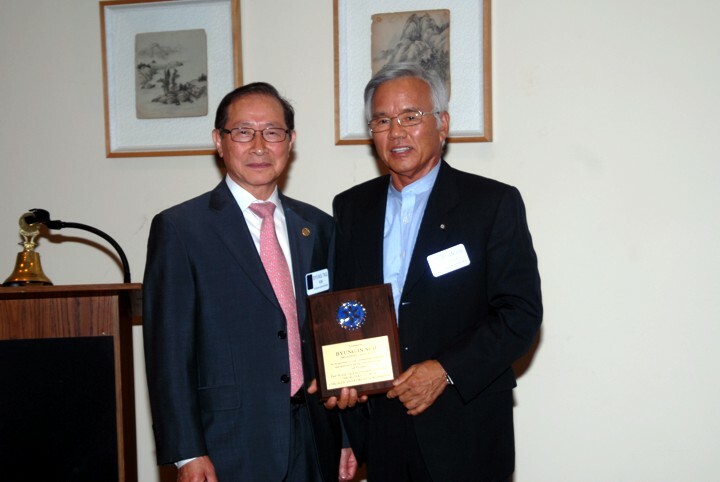 Dr. John Kim / Unidex Group, Inc.
At July 11th Meeting, a ceremony for gratitude plaque presentation to the going-off staff members was held. 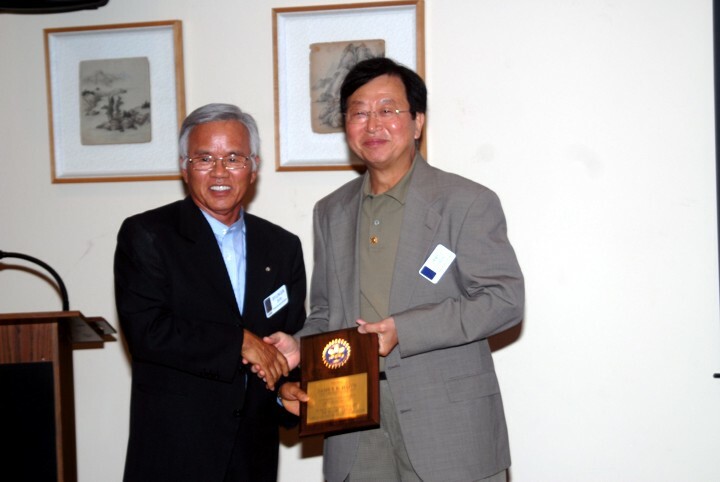 The new president, Kim, Byung Tag presented to the previous president, Suh, Byung I and other members praising their extraordinary works and achievements for the organization and asked for the contineous support to improve, especially in terms of membership retainment and drive. Photo-images at the ceremony are shown. 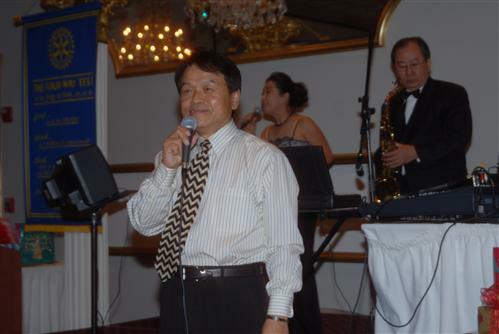 One of our club rotarian, Young Hee kang is the out-goig president of Korean Culture Center, who has served past three yaears. 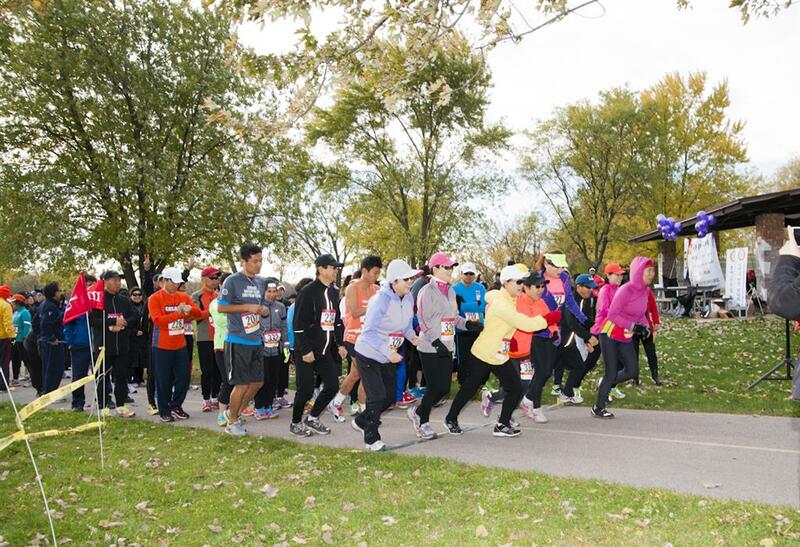 She has also servd for various civic orgarnizations such as president of Ewha Univesity, president of Chicago Korean Womens Association, etc. She has been instrumental for making possible for Korean Cultural Center to open to the public and practically functional in reality. Since she took over the post, she worked relentlessly to accomplish the task for acqisition of Koran Cultural Center Building in Wheeling, Illinois. 여러분, 또 한해가 저물어 가고있어 크리스마스 그리고 신년 맞이 준비에 분주하시겠조? 올일년 동안에는 모든 회원께서는 공적으로나 사적으로 많은 일에 좋은 성과를 거두어신바 명년에는 더욱 보람있고 훌륭한 사업계획을 갖고서 좋은 성과를 거두기를 기원하는 바임니다. 지난 17일 금요일 저녁에는 많은 회원과 손님들을 모시고 즐거운 유흥 프로그램과 선물 교환으로 마지막 으로 한해를 보내는 뜻있는 저녁을 모두가 함께 즐겼음니다. 그때 찍은 사진일부를 이 웹사이트에 계재하는바 더 많은 사진을 Photo-Album Column 에서 볼수있음니다. 지난 11월 18일 11명의 우리 로타리언들은 Greater Chicago Food Depository 의 봉사활동에 참여했다. 8천 파운드의 음식물을 8백여 개의 박스에 나누어 담는 일을 세 시간에 해냈다. 처음에는 낯선 일에 서툴기 짝이 없었지만 곧 익숙해져 수련공 못지않은 솜씨들를 뽐냈다. 포장된 이 음식물들은 시카고 주변 교회와 셸터에 보내어 배고픈이들 에게 전달 된다고 한다. 시카고의 아름다운 가을날씨 즐기고 계시지요? 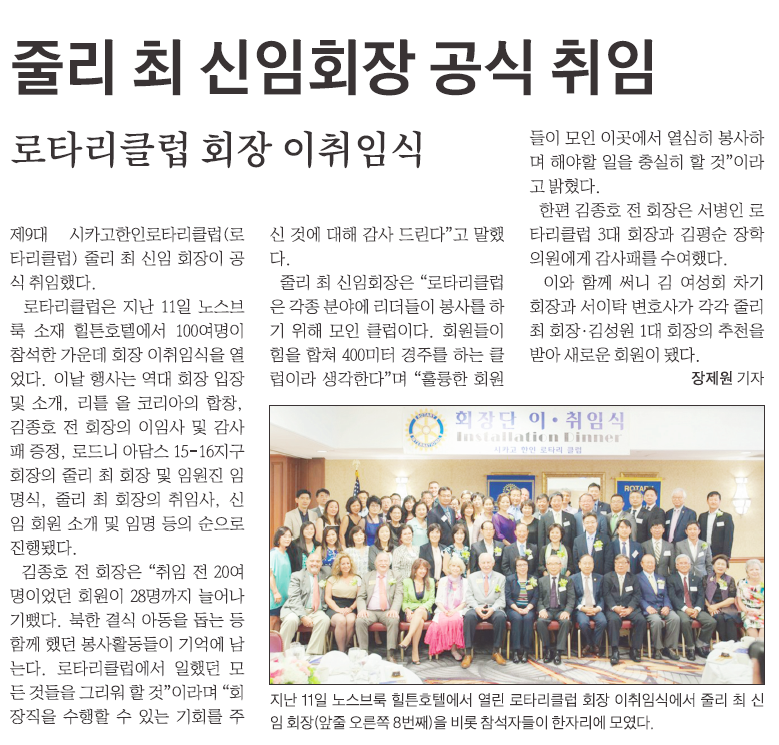 어제 열린 이사회에서 2010-2011 의 Service Projects 에 관한 여러 중요한 안건들이 통과 되었습니다. 그동안 수고하신 Service Projects Committee 윤원 Chair 님 과 Committee members 여러분께 감사를 드리면서, 2010-2011 년 Service Projects 로 채택된 사업을 여러 회원임께 알려 드리겠습니다. 자원봉사 - Food Basket Program @ Kennedy-Kings College - 12/8/10 - Details to be provided by Service Projects Committee (SPC). TRF Ambassadorial Scholarship - Project to be carried out by SPC with the manpower and funding support of the club. Click the link, http://www.rotary.org/en/StudentsAndYouth/EducationalPrograms/AmbassadorialScholarships/Pages/Howtoapply.aspx, for more info. 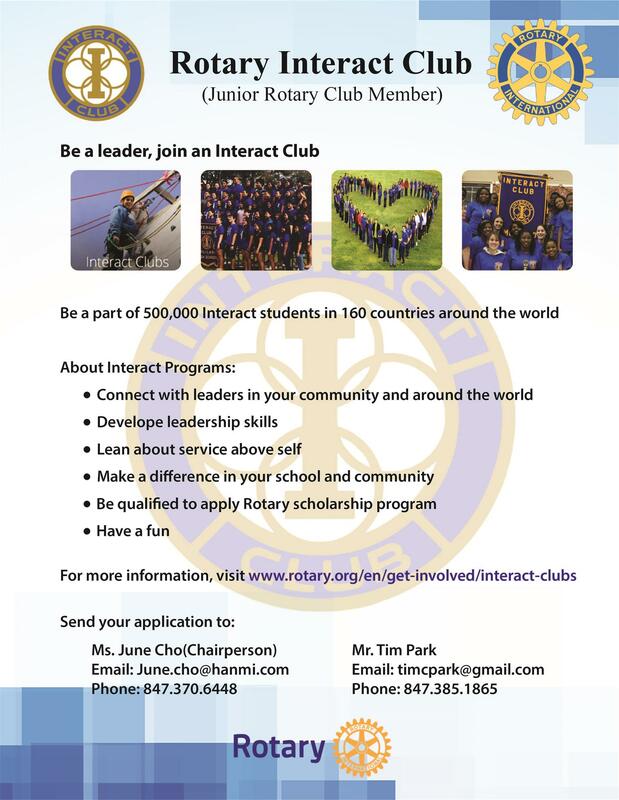 Interact Club - Project to be carried out by SPC with the manpower and funding support of the club. 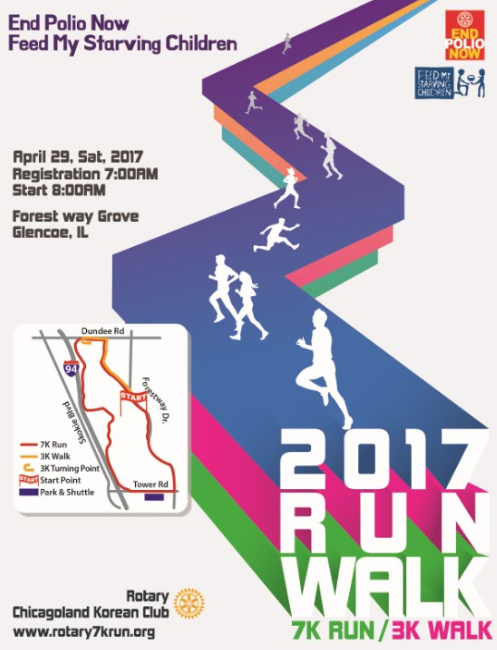 Click the link, http://www.rotary.org/en/StudentsAndYouth/YouthPrograms/Interact/Pages/ridefault.aspx, for more info. Additional International Service Projects - Announcement on these projects will be made in November. Autumn has arrived to bring cool pleasant breeze and cornucopia of harvest. Although it often puts us in nostalgic, sometimes even melancholic mood, autumn is a great season. Since autumn equinox passed by quite a while ago, days are getting short and nights are getting longer and holyday season is approaching. It is time for us to read more and think more. I have a poem on October and one of my own which was written some time ago. While she was brewing wine. But it is still vivid in my memory. While my mother was around. September 23 is Autumn Equinox, which has equal length of day and night, and also coincide with first day of Autumn. From now on, night starts to get longer until it reaches Winter Solstice. Autumn season is great, at least to me, which brings cornucopia of harvest and cool pleasant breeze, although often fetches nostalgic, even melancholic mood. That is why people become ponderous and more sophistcated while reading and thinking. Anyway, it is time to enjoy great nature, beautiful autumn foliage! Club Website 를 방문해 주셔서 감사합니다. Club Website 에 대한 회장님의 안내말씀 more ... 를 Click 하시면 읽으실수 있습니다. Whenever we tear off a sheet of calendar, especially when a season turns to another, we feel that times flow like a flowing stream. August has passed by and September has arrived as hot sultry season is just about over. I just came back from a tour in the nations around Baltic Sea, which has given to me unforgettable experience and memories. Here, I would like to share with you some by posting pictures, which I took during the tour. 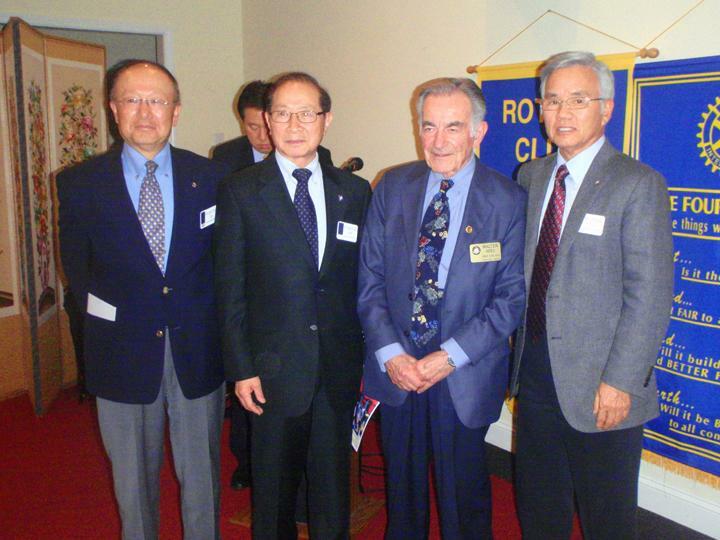 How are you, all members of Chicagoland Korean Rotary Club? It has been hot sultry days so everyone must feel uncomfortable. However I am sure everyone is doing ok.
Ill be leaving for European tour around Baltic Sea on Sunday so I'll miss two weekly meetings and all of you. I hope everyone have nice time until I see you again! The following is the youtube website where you can get USA National Anthem. By clicking it, you can have vocal and lyric of National Anthem. ps: Apparently there is some problem in the program as to filtering images so it appears somewhat fuzzy. I am working on to make them appear clear. 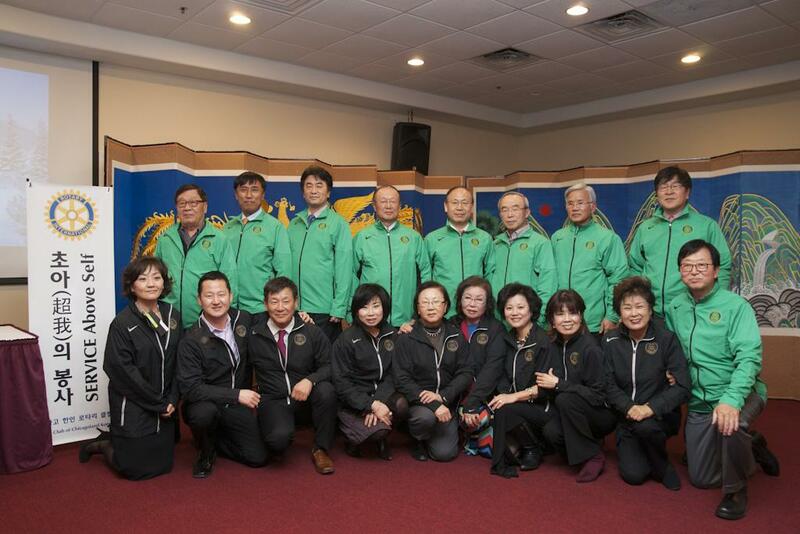 Thirty plus Chicagoland Korean Rotarians and guests gathered at Irae60 Sushi Restaurant at Vernon Hill. 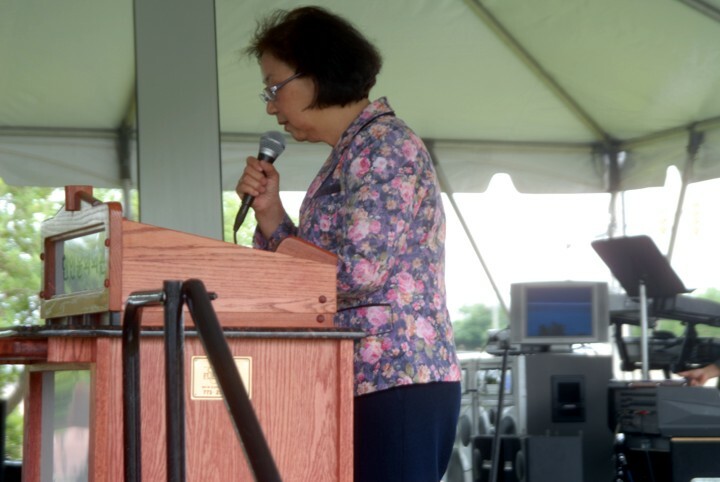 It began with brief introduction speech and toast by President, Suh ByoungIn. After a great Sushi dinner, there was anniversary cake cutting. Everyone, who attended, seemed to have a great time. At weekly meeting on July, 19, Jian Ping, the author of Mulberry Child, presented her story as a child during Cultural Revolution in China. It was a moving story, thereby all attendants enjoyed the evening with her. She also autographed the book for one who bought. It is my honor and privilege to serve you as Club President for RY2011. As you all are aware, we are still in our infancy as a club. 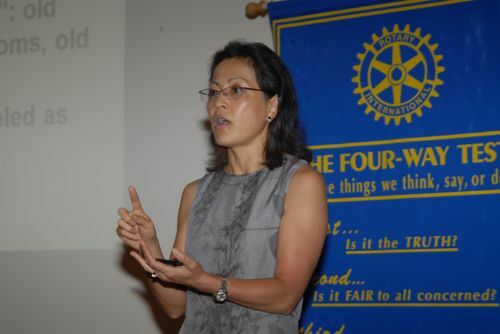 One of my goals as President is to continue our growth into a more robust and mature Rotary Club. This year's Rotary International motto is "Building Communities and Bridging Continents." 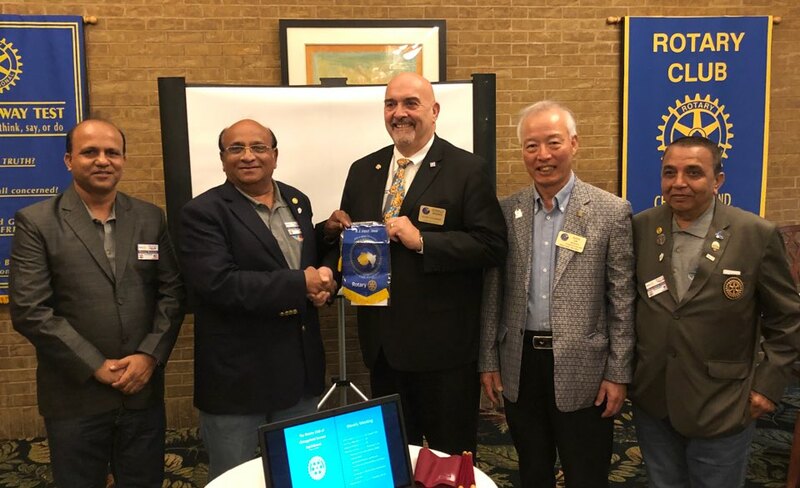 As a club, we will work together to promote fellowship among fellow Rotarians, and to encourage and foster the ideal of service to communities – both local and global. We will also continue our fundraising efforts for End Polio Now, as part of the US$200 Million Challenge. For more information on supporting our efforts please contact us. I look forward to a year of exciting projects, successful fundraisers, and membership growth. Let's work together to build our communities and bridge continents! 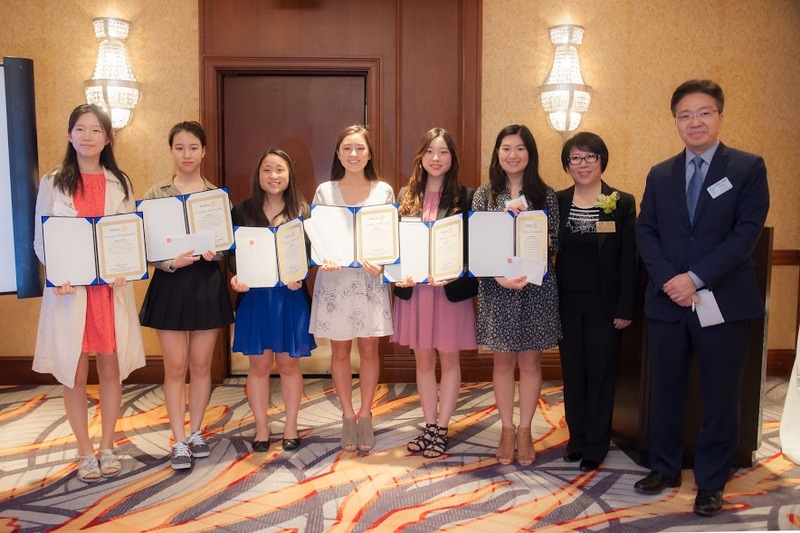 Ceremony and party was held at Woo Lae Oak Restaurant on June 28. 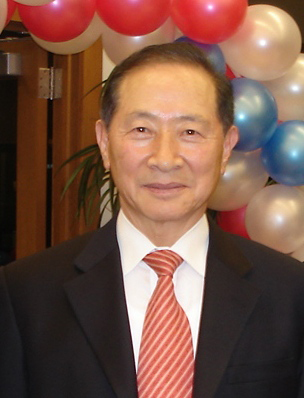 New President, Byoung In Suh was sworn in, which was witnessed by many attendants including past RI President, Lee Dong Geun. 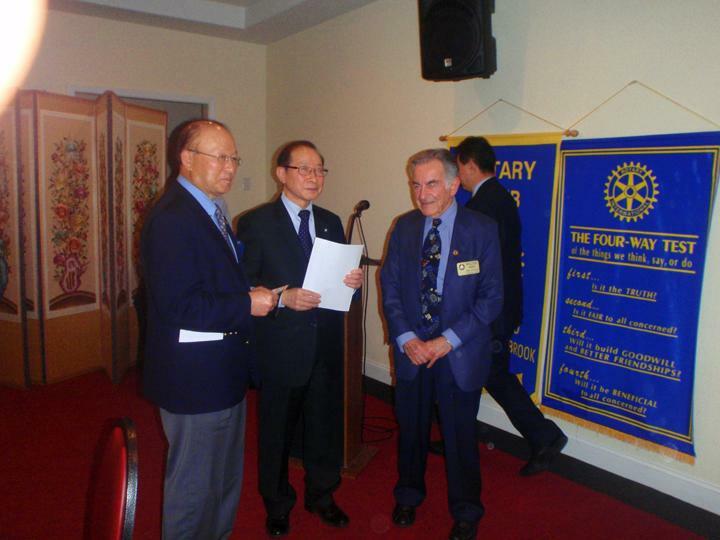 Photo shows Rotary Club Banner Transfer Ceremony. Coming Sunday, June 21, is Father's Day, which is as much significant as Mother's Day just as mother and father are equally important in the family. Everybody has a father, therfore everybody should honor father. Give a big hug to him and a celebration by giving a gift or taking him to the restaurant for dinner, etc. May 25, Monday, is Memorial Day, which is fedral holiday so this weekend becomes a long weekend known as Memorial Day Weekend. 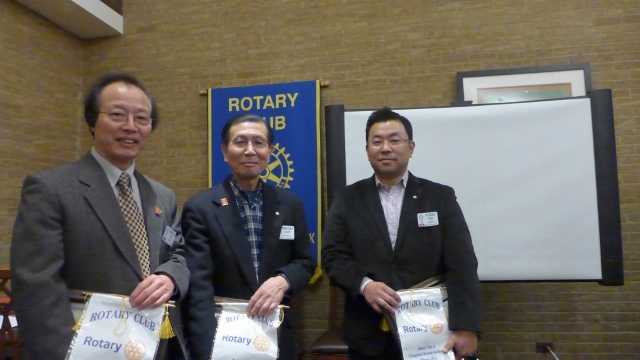 Double Sapphire Pin was awarded to Suh, ByunIn for his generous contribution to Rotary Club. 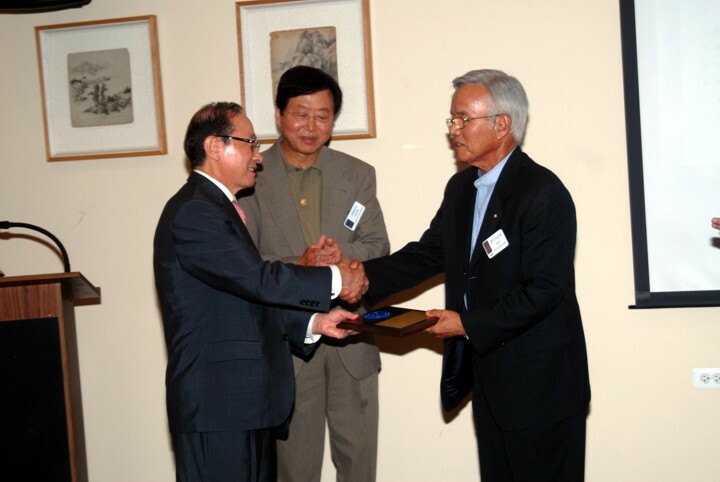 The picture shows that President Kim, SungWun is putting the pin on the lapel of Suh, Byung In. I am certain on that everybody is prepared to celebrate Mother's day, whoever he or she is, son, daugther, son in law, daughter in law, etc. May 10, Sunday is Mother's Day. May! The word of May alone may make us excited. May is the month of family, while we celebrate Mother's day, graduation, wedding, etc. along with spring festivity. 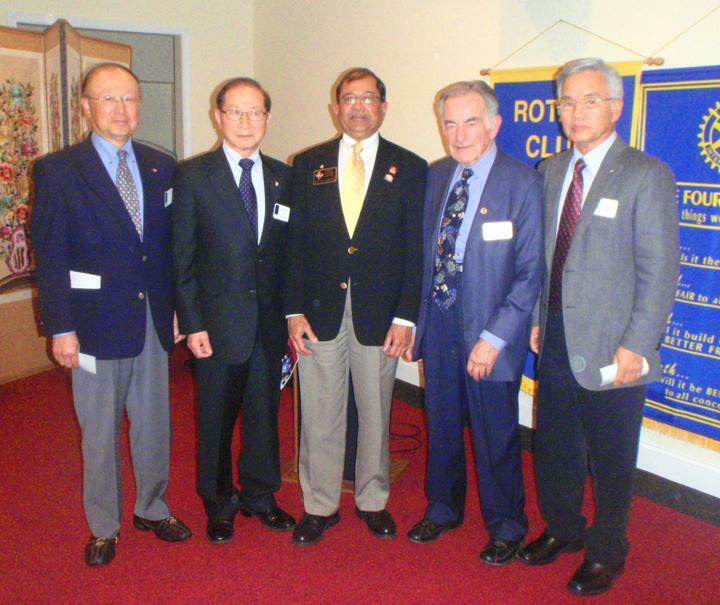 Members of Chicagoland Korean Rotary Club, how have you been? It seems many months have passed away since I went to Portugal and Spain for a tour with President, Sung Wun Kim and some other members. In fact it was only 10 days. 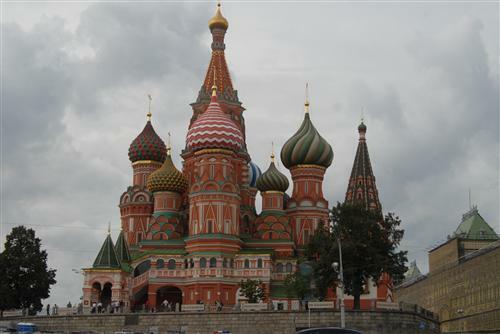 We spent a wonderful time over there while enjoying beautiful sceneries and unforgetful historical as well as cultural experiences. I intend to talk about the trip more later on. Picture is Earth seen from Apollo_17. For more stories about Earth Day, please read the following article. Earth Day is coming soon. 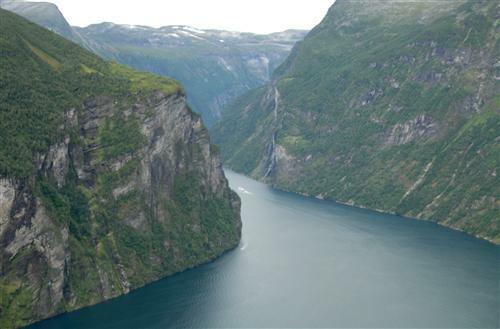 April 22 is the day for Earth Day Celebration. How are we going to celebrate? To me, it is not having a party but doing something meaningful for the earth. 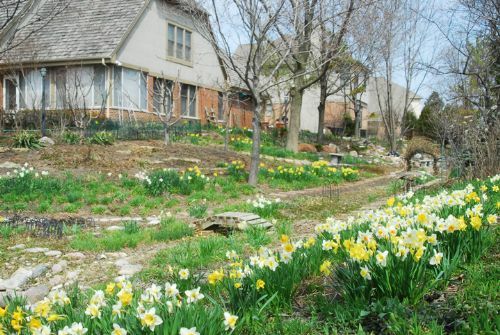 When April comes, everyone feels that spring has sprung. It is really springtime. She did not disappoint us! She is really a queen of ice-figure skating, the champion of champions on the ice. 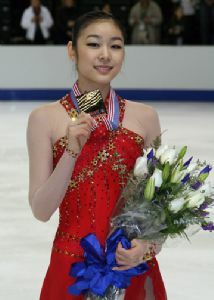 After she won world championship of figure skating in 2009, she got olympic gold medal acquiring indisputablle reputation that no one can beat her on ice, just as Scott Hamilton said: It is hard for anyone to beat her! "Do not look for spring faraway from your vicinity. Spring comes first always near you just like happiness is in the corner around you." It is still chilly outside but if you have gone outside to look around in your backyard, you might have found crocus blooming. It means spring is here already. This is the poem titled "The Daffodils" and written by William Wordsworth. This is the first poem on nature in the springtime. 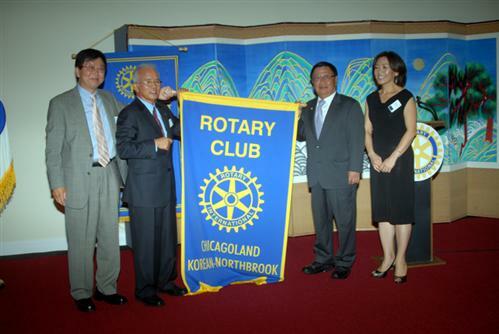 I am genuinely happy to launch the Website of Chicagoland Korean Rotary Club. This website will help us to communicate better among members and promote our goal to fit for "The Four Way Test". Remember that the website is worthless unless being used.